Personalization is critical to the success of your business model. Many of the most innovative and beloved companies in recent history -- think Facebook, Amazon, Google, Netflix, Pandora, Spotify and Hulu, just to name a few -- have transformed customer expectations and disrupted their individual industries. Now customers expect it. It increases clicks, open rates and conversions -- usually by pretty substantial margins. But -- how do you DO it? The process is different at every step of the customer journey and there's a lot that goes into personalization. What's more, there's a lot more ways to reach your customers than ever. Personalizing display ads is very different from personalizing emails or a mobile app experience. The data, content, and delivery mechanisms necessary to personalize those messages changes -- and so should your strategy. We're taking a holistic look at the art of personalization -- from customer expectations to ROI. We'll show you a new way of looking at identity -- from both the customer's behavior to predicting their behaviors. 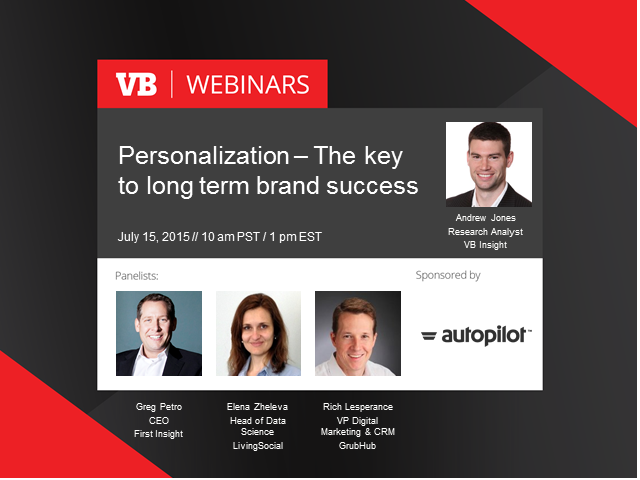 Register for this webinar today and get started doing personalization right!